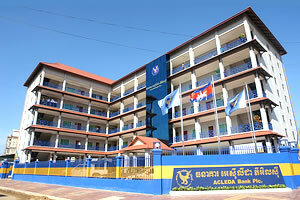 ACLEDA Bank Plc., the bank you can trust, the bank for the people and the Cambodia's leading commercial bank in Cambodia, announces today that ACLEDA Training Center, a wholly-owned subsidiary of ACLEDA Bank Plc., which established since June, 2011, located at #50, corner of street 516 and 335, Phum 6, Sangkat Beung Kak I, Khan Tuol Kork, Phnom Penh, Kingdom of Cambodia, obtains the license as a higher education institution named "ACLEDA Institute of Business" with reference to the sub-decree of the Royal Government of Cambodia No. 13 ANKr. BK, dated January 25, 2016. Mr. Chhan Pon Loeu, Director of ACLEDA Institute of Business, said that, "The obtain license as a higher education institution is following by the strategy plan on provide training and education for Associate's degree, Bachelor's degree, and Master's degree on Department of Business Administration, majoring in Banking and Finance, and respond to the training needs for skill capacity development on Banking and Finance to the National and International Organizations, local and oversea students. The institution has invested on the land which size 75,750 square meters, located at Anlong Kngan Village, Sangkat Khmuonh, Khan Sen Sok, Phnom Penh, which is being built personal study building with International Standard in 06 buildings with the budget plan of US$ 21 million, for 627 staff working, and 2,866 students per shift. It has a library with the land size 1,651.37 square meters and also has 02 dormitories building for 362 students. These building will be finished in 2018." During this grand occasion, the Shareholder holding 100 percent in ACLEDA Institute of Business (AIB) represented by Dr. So Phonnary, President & Group Managing Director ad interim of ACLEDA Bank Plc., said that, "The establishment of ACLEDA Institute of Business is the evidence of a more high commitment in human resources development in the field of Banking and Finance for the students, national and international organizations both local and oversea for human resources development with high quality standards." She added that, the students educated from this institution will be had the sufficient capacity, specialties and skills in the fields of banking and finance to join the work in the Banking & Finance Institutions both local, ASEAN Countries, and oversea. The graduated students need to receive the academic certificate at level of their study with recognition by the institution and Ministry of Education, Youth and Sport. Currently, ACLEDA Bank Plc. has 05 subsidiaries which are ACLEDA Bank Lao Ltd., ACLEDA Securities Plc., ACLEDA Institute of Business, ACLEDA MFI Myanmar Co., Ltd. and ACLEDA Properties Ltd. By the end of December, 2015, ACLEDA Bank Plc. has total assets of US$ 3,844 million, loan outstanding US$ 2,454 million, and deposit US$ 2,616 million.